This gets my vote as one of the cooler products at Interbike. 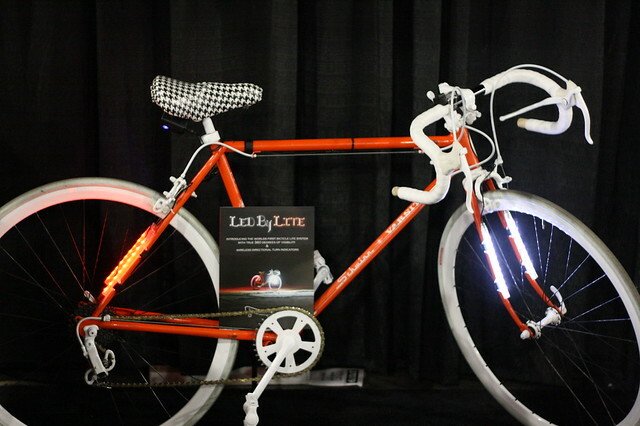 It’s a unique LED light system where you can use it as turn signals by pushing buttons on a remote located on your handle bar. So the way this works, you have left and right front/rear lights. 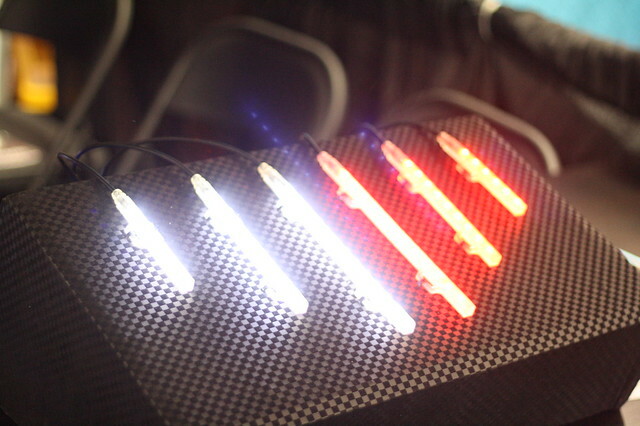 Here’s a snap shot of the lights before they are mounted on the bike. The remote has buttons for left or right. Hit either side to activate the front and rear lights. So if you’re turning left, you hit the button for the left arrow, the front and rear left side will blink, and same goes for the right side. 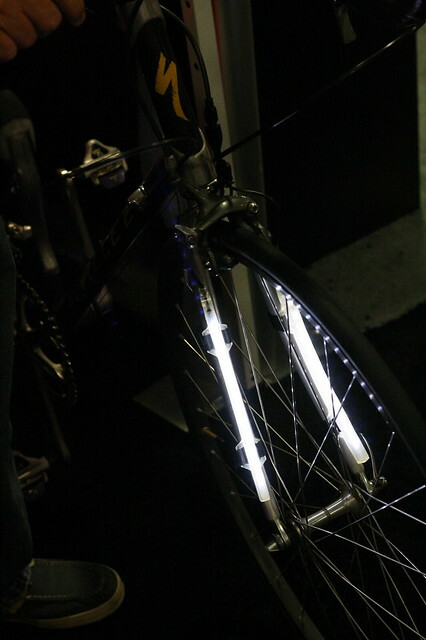 This light system definitely has some potential in the bike commuter world. We’re hoping to get some to test out from LITE. I think they look awesome too. I just hope they actually ship the product ever. I’ve been waiting for nearly a year after reading about it from Interbike last year. The turn signal addition is great! Great concept. I wonder if it will be adopted by the bike world. In the meantime, I can just as easily signal the old-fashioned way in this Signal Hoody. That’s pretty cool. You make it work with a dynohub and you’ve created a perfect product for urban commute bikes. Turn signals are a great idea. Now THIS is a cool setup — and I wonder why it has taken so long to develop a simple, elegant solution like this. 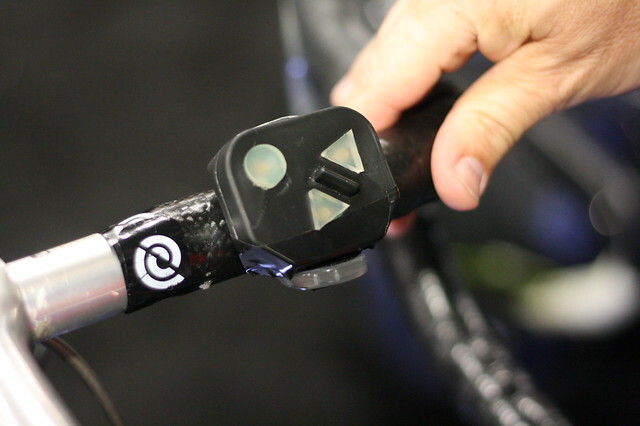 I mean, I’ve heard commuters grumbling for years that they’d like some sort of turn-signal system for their bikes, and there have been a few stopgaps on the market, but this really looks good. Now, I should add that turn signals are only good if a)you’re looking for them and b) you actually use them. We all know plenty of motorists (and cyclists) that don’t signal their intentions with lights or hand gestures. Umm, or will motorists and pedestrians even get it? Seems like I’ve seen cars almost mow over signaling mopeds at night in downtown HNL. This looks AWESOME to try out on the guy in the Hyundai who told me to take the bus. I would love to see the rear turn signals installed in a bar (w a red taillight in the middle) on the rack. It would then be high enough, behind any/all bag configurations, and it would enough like some motorcycle turn signal setups to be easily identifiable as such. These would work great on an Xtracycle configured bike. Just mount these to the rear uprights of the V-racks as well as the forks and you’re set. Hmmm… would the cables be long enough to run to the rear of an Xtracycle? Would back this and get a set but it would not work with my panniers/rack setup. I don’t know if it’s already been suggested, it might be more convenient for some set ups to have an individual turn signal button for the left and right handle bar so you don’d have to displace your hands and compromise stability ie place the buttons by either brake? Scott, this system actually will work with just about any pannier/rack setup. Go to their website (www.ledbylite.com) and check out the picture gallery. Also, as they show in one of the videos, you can customize the system by using standard USB cords, so basically the only limiting factor in terms of customizability (is that a word?) is the user’s imagination. Graham’s idea is awesome. This product is also awesome. I preordered a set, and can’t wait to get them!